I see a lot of posts on message boards asking about Italian Census records. There really aren’t any of the type you see in North America or the United Kingdom. This photo is an example of how a census was conducted. Each person in the town had a personal record card indicating all their personal information. In this example, name, parentage, date of birth, marriage etc would be found on the reverse. 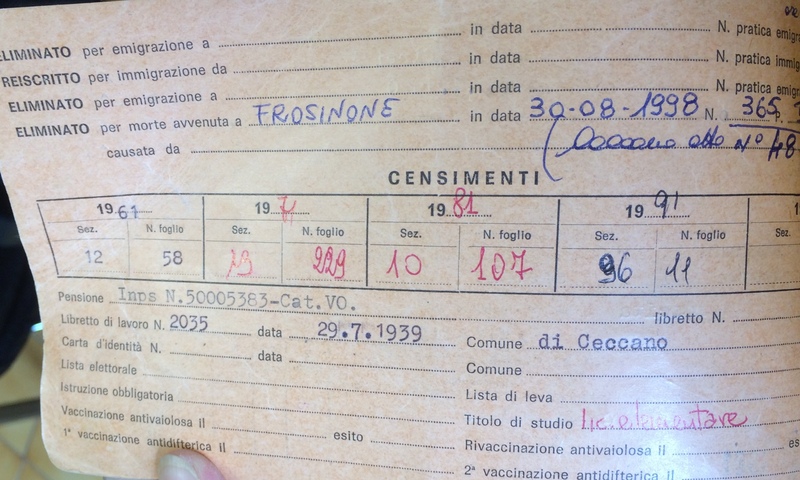 As you can see the Census (Censimento) is indicated in the middle. Every census year a postcard is mailed to the person’s last known address and they are asked to report to the town anagrafe office where their card is then updated for the census year. In this example, the person was present for the years of 1961, 1971, 1981, 1991 and died in 1998 (above). If they don’t report, a local policeman is sent to the last known address to find out why and the results noted. i.e. emigrated, moved to another town, died etc. This card system was in place in most towns from 1936 although I have seen it as early as 1906. The information must come from the town of birth. You can write to Genoa yourself for his birth record or I can do it for you.